I have a small sauce dish (I think and which I realize I don’t think I have ever posted) and have long wanted a larger piece so that you can really see the lions. I came across this piece last weekend in St. Jacobs at the St. Jacobs Antiques Market. I was very surprised to see it. It was not very expensive, but I hesitated for a few minutes, but realized that I would be super, super sorry if I didn’t scoop it up ! 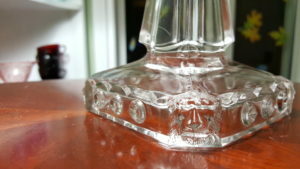 I have only ever seen this piece online and didn’t realize that the finial had two faces! I really love the lions on the finial, the corners of the foot and on the corners of the dish. The book American Pattern Glass Table Sets by Gene and Cathy Florence has some information on this line. 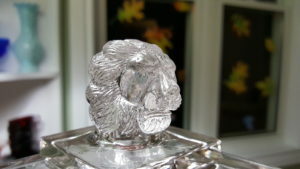 They say (page 75) that the pattern is also known as Clear Lion Head, Frosted Atlanta, Late Lion, Square Lion and Square Lion Heads. 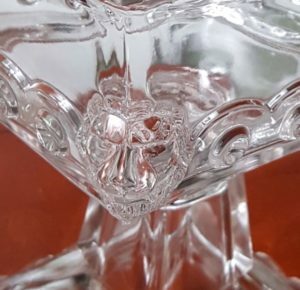 They also state that the pattern was introduced in 1895 and that it was produced in crystal and crystal with frost (plain or etched). I would love to know why it is called “Atlanta”. If anyone knows, please share. 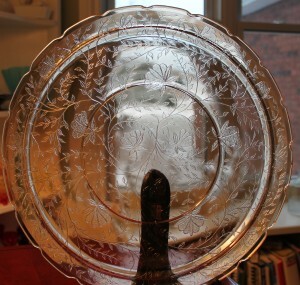 Came across this pretty platter in the Marigold. Absolutely pristine. Very pretty. Update to the original February 28, 2012 post. 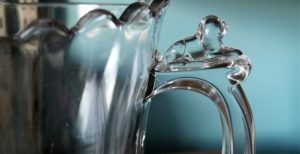 I have joined a Facebook group called Depression & Vintage Glass ID. I enjoy his trolling the posts and was very happy to see that one of the members has posted this exact Depression & Vintage Glass ID. compote. I was surprised to discover that this is a piece of Floragold by Jeannette (circa 1940s-1960s). I had always assumed that Floragold meant that the pieces would be amber/marigold in colour. Turns out that the Floragold refers to the floral pattern in the centre. The pieces are also commonly called Louisa. 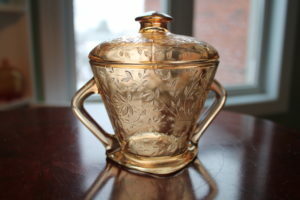 Here’s an explanation from AllExperts: Collectibles-General (Antiques)/Floragold aka Louisa eapg. 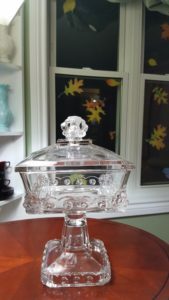 “Westmoreland Glass made Louisa in Carnival glass originally. Jeannette bought the moulds from Westmoreland. If you go to http://www.ddoty.com/ and type in “Louisa” you will see a history of this lovely pattern. Floragold was one of Jeannette’s most extensive patterns. 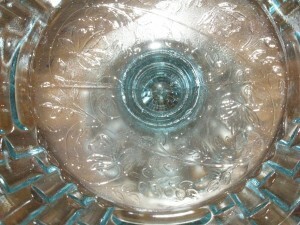 It has a Depression glass look with its mold-etched flower design. The shapes are interesting and combine square bases with rounded shapes and ruffled rims. Floragold is a fun pattern to collect because it came in so many shapes and pieces. You can put together a complete dinner or lunch set, including dishes, bowls, cups, saucers and tumblers. 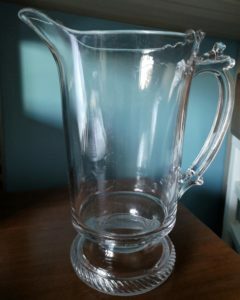 Serving pieces include pitcher, several bowls, platter and shakers. Floragold has ruffled and plain bowls in several sizes ranging from sauce dishes to larger console-size. A poster from the Depression & Vintage Glass ID indicated that the blue pieces were only sold at a store named Krogers. I am happy to know where this piece came from. Where it is now is in question. Probably in the garage. This is a weighty piece of light blue glass with a pattern at the bottom of the bowl. Can’t recall where I even got this, although I remember I had to reach up high to get it! 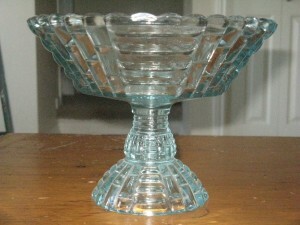 I have a number of compotes/comports, and candy/nut dishes. I mostly put candles or seashells in them. The trouble is that they take up so much storage space. This one is of a good size to put fruit in. Funny though…the prettiest part of the design is the interior pattern. Once you put something in it – like fruit – the pattern is covered up. 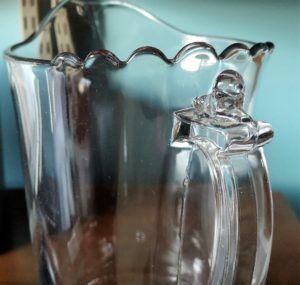 I suppose glass designers know way more than me, but this doesn’t make sense.